I had a large amount of yellow Super Saver yarn, so I thought, what better project to use it on than a sunflower? I found this pattern online but created it with a few modifications: Amigurumi: Happy Sunflower. At the end of July last year, we drove through Lee, New Hampshire and passed by this incredible sunflower farm in full bloom. 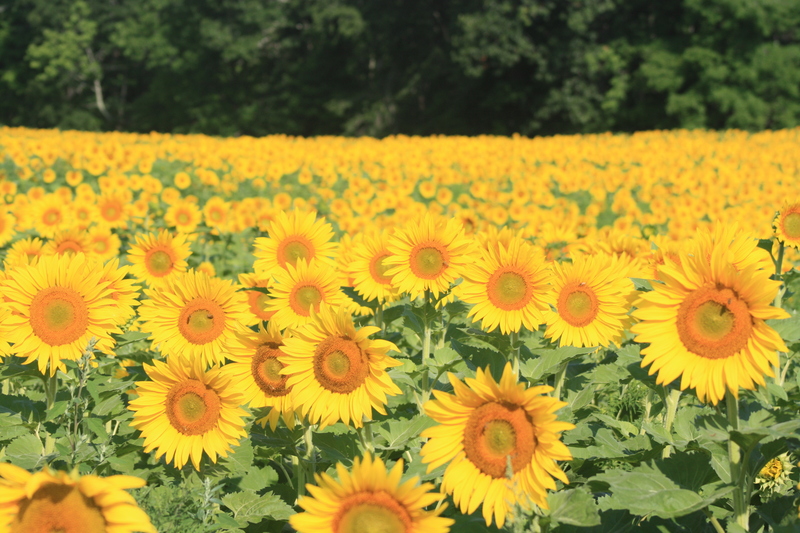 I have never seen so many sunflowers in one place! The process of creating this amigurumi was a long one. In the middle, it looked like some alien plant had taken over my table. When I started the assembly, everything looked disproportionate. The head looked way too big and the petals looked too small. So I frogged back the head several rows, which made the eyes look super large, but not too bad. I also didn't have any felt for the eyes so I just sewed them in with embroidery floss. Then I frogged back all the petals to the row with 16 stitches and increased them to 20 stitches before decreasing again. This required attaching new yarn when I ran out of the original. It took forever! But in the end, I have this happy sunflower to greet me!